Adventus: Is our children learning? "CLEAN UP ON AISLE SIX!" 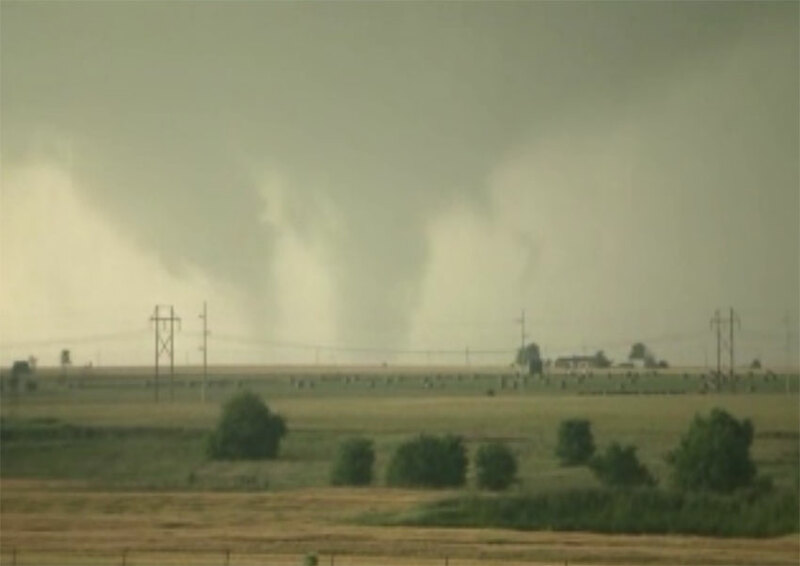 "World's Highest Standard of Living"
The tornado that hit Moore, Oklahoma was a mile wide. 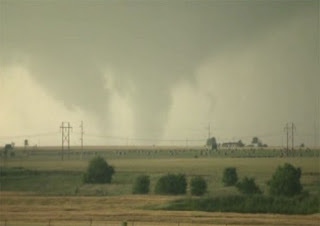 The next tornado (now the most recent) was two miles wide. In response to this literally unprecedented set of events, the Oklahoma legislature has decided to create a non-profit group to raise money to buy safe rooms and shelters for Oklahoma public schools. What Blake was describing, and criticizing, there was a society more concerned with the privileges of power than with the obligations of society. Chartered streets were private concerns. You could literally be forced off of them if your presence was not appreciated by the owners. The 18th century Oklahoma, apparently, wants to return to. Because, why should the government protect the children it requires get an education in the first place? Why not make it possible for private interests to show their concern? And if this doesn't raise enough money by the next tornado season, well, they tried, right? My sympathies were with the people of Oklahoma when the tornado hit Moore. The lack of shelters didn't strike me as the problem others thought it was, mostly because I didn't think it fair or wise to critique such a lack in the very face of the disaster. It struck me as rather like blaming the victims. But now, when the state legislature of Oklahoma won't mandate even the least sensible protection for public schools? When they can't be bothered to mandate anything more than buildings that will stand up and not catch fire on a hot day? Why not just turn over traffic lights and road construction entirely to private concerns, and let them raise the money necessary for such things? Emergency officials have estimated it costs between $600,000 to $1 million to outfit a school with a classroom-sized safe room. Oklahoma has more than 1,600 public schools. Lorry nose, we can't expect the state to raise that kind of money and spend it. Isn't it intrusion enough that they require students to get an education? And the fund starts off with $500,000, and another $500,000 in matching funds for donations. 1/2 of one school down, 1599 1/2 to go. Next thing the legislature will be taking up collections to build schools. Oy. That is a laughable effort. So meager that it is a parody of itself. Very Dickensian on the part of the Oklahoma legislature. It's clear they are lovers of history. Last week's St. Charles, Missouri F3 tornado missed our house by four hundred yards. That might sound like a lot or a little depending on your point of view, but bear in mind this thing traveled for thirty miles and was likely over a quarter of a mile wide at times - so to us it missed us by just a little. The storm sirens went off and in eight minutes it was upon us, just enough time to extract terrified cats from underneath a bed and head to the basement. Living in the Midwest all my life I've been through a lot of storms: this thing was something else. The rain was so heavy and the winds so strong that the windows looked as if they looked on to aquariums. The din from the roar of the winds, constant thunder, and wail of the sirens was like nothing I've ever heard. The power went out as soon as it hit, as did cell service, and we sat nervously in the dark underground while the house shook. But at least we had a safe spot. Storms don't frighten me but I cannot fathom having been in the midst of a creature like this and not have been able to seek refuge underground or in a hardened concrete shelter. It must be terrifying. And to be willing to sacrifice one's constituents to it over and over again just to please the gods Mammon and the other one who hates liberals evidences a terribly diseased spirit. We were so fortunate that our house was undamaged and we were unharmed. Our discomfort was limited to a relatively sleepless night as without power or cell service we had no way of knowing if the second line of storms predicted to come our way and bring tornadoes was bearing down on us. Our neighbors were not so fortunate. A quarter mile from our home the fences were down, trees were broken and split, and houses lost bits of roof and siding. A hundred yards past that homes were piles of sticks. Some were speared through with trees, collapsing them like lungs, others saw parts of their structure just torn away and discarded. I saw the proverbial odd damage inflicted by the physics of high winds: a two by four plunged into the side of a home like a missile, metal siding wrapped around signs, trees and metal street signs not just bent or broken but twisted. A hundred people lost their homes and over a hundred more suffered damage in an area I could bike to within a few minutes. I cannot express how fortunate I feel. Miraculously, no one was killed and injuries were minimal. This probably had a lot to do with the fact that every single one of these homes had basements in which people could find safety. I understand Oklahoma can't build basements. But they can build shelters, indoors and freestanding. They can and should do more to protect human life than do the equivalent of putting out a donation can and seeding it with a nickel. Human life is worth more than a nickel. From what I understand some of the schools in tornado country have incorporated shelters into the design of the school, a number of the classrooms are built as shelters but are used most of the time just like any other room. From what I've heard on the radio, it's not all that much more expensive. On the radio I also heard some of the politicians saying it was a matter of "principle", of not imposing requirements. Our governor said a similar thing yesterday when he vetoed a bill that would have required the teaching of CPR and similar techniques of first aid in Maine schools. It's a disease of conservative thinking, not a regional symptom. The blog bashing of Oklahomans on the day of the tornado was a different thing. It was based in regional stereotyping and blaming victims. It was entirely inappropriate and was pretty foolish, more likely to incite a reaction to the attack than encouragement to change things. I'm finding a lot of that on what gets called "the left" but isn't any left, these days. "Lives...you can't count the value or the cost of lives. But you can count the cost of construction. It adds a significant amount of cost to construction; the taxpayers would have to determine whether they're going to pay that or not." As Randy Newman sang: "It's money that matters/in the U.S.A."
"If you're living in that area of Moore in Oklahoma, the likelihood of being hit by another tornado is about zero in terms of odds," he said. Well, it was, until a two mile wide storm came along, and right close to Moore, as I understand it. Close enough, anyway. Moore explained on its website that it didn't think community shelters would work, because there are too many people in the community; which made sense. But the idea of not requiring shelters in schools statewide strikes me as also abolishing building codes because it's a matter of "principle." And while I once lived in southern IL in a house with a basement (the only time I've ever lived in a house with a basement), and never had to go to it during a tornado, I'd still rather have a storm shelter, so I understand the many reasons people on "Tornado Alley" don't automatically build basements to hide in. The bashing that turned my stomach was, as you said, both inappropriate and ignorant. Most of the assessing of worth is extremely tribal, even as they denounce "tribalism" in others. Feh. I'm surprised they haven't already.